I systematically explored the waterways of Tennessee’s landscape for great paddling destinations. I sought to include paddling destinations that would not only be rewarding but also would be exemplary paddles of the varied landscapes offered. In the east, the Hiawassee River forms the crown jewel of Blue Ridge paddling destinations. But these mountains offer other paddling places, such as the crystalline Watauga River or the brawling Nolichucky. 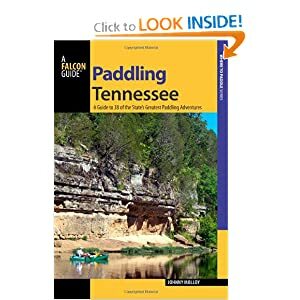 And what good is a Tennessee paddling guidebook without including Tennessee’s contribution to great rivers of the world — the Duck? The Duck River flows through the botanically rich heart of Tennessee. The Duck River has a little bit of everything, flowing from the Cumberland Plateau through the Central Basin and into the Western Highland Rim before emptying into the Tennessee River. The stunning Buffalo offers sheer bluffs rising from clear green waters across from which lie inviting gravel bars. The Hatchie makes a serpentine course through the back of beyond. There simply is no other Reelfoot Lake. Created by earthquake two centuries ago, this stillwater wildlife refuge is something you must experience for yourself – with the help of this guidebook of course. Then, when you cobble the paddling destinations together it presents a mosaic of Volunteer State beauty and biodiversity that’s hard to beat!